The Spring and Summer of 2011 have been very active times for Nazareth House Apostolate; both in America and in Sierra Leone. and into more rural areas. In America, NHA has been establishing St. Simeon Skete. 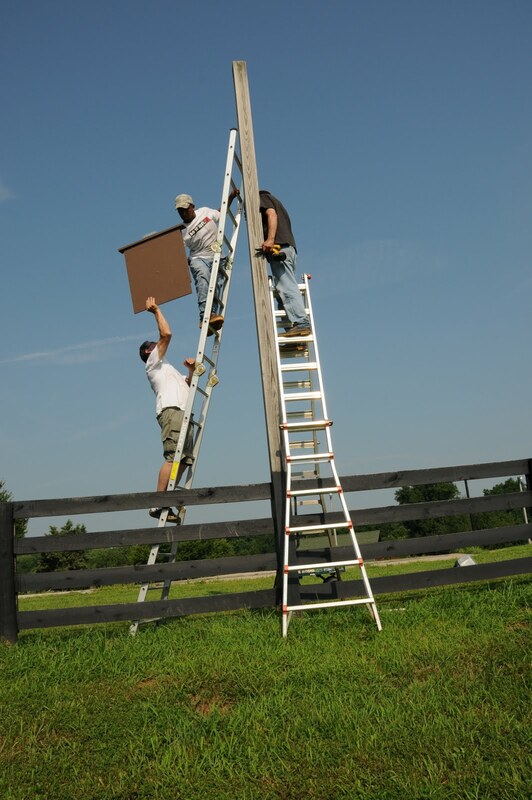 its been going on for many decades - it was simply a matter of doing it in a different place. In this case, the location is a more suitable place, one much more conducive to the prayer life. In Africa, NHA is establishing the new NHA Compound. Again, the work of loving & caring for the people in Africa will remain the same, only the location has changed. There are outlying villages that desperately need our help. And... our NHA School with all its needs is right there next to the new compound. So as it is with NHA America, the new space in Kabala is much more conducive to the work it performs. In Africa in Kabala and in America in Kentucky, both NHA headquarters are surrounded by the finest of nature's beauty. Yet there is no time to get lost in the allure of such tranquil settings. 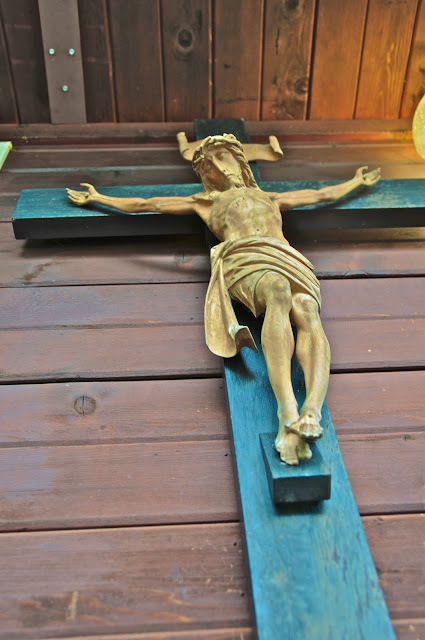 In addition to the prayer life at the Skete in Kentucky and the humanitarian work at the Compound in Kabala, both facilities require much physical upkeep on the buildings and property. There are six buildings on the grounds at St Simeon Skete which include: The Chapel including the bookshop, Anna House, the Kellia, the barn, the stone hermitage and St. Arsenius Hermitage located deep in the woods. Every building is in need of regular maintenance and upkeep - as well as the usual repair work. but as of last week we are now also physically cloistered. We now have a new fence surrounding the front of the property. One of the things we’ve been missing is the church bell. It is used to call us to scheduled prayer times. 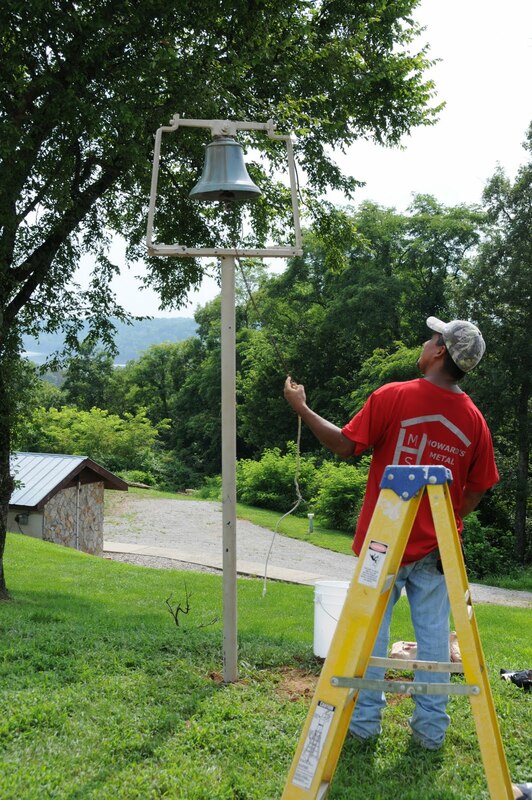 As Jesús and his son, installed the bell pole into the ground with concrete, he wanted to make sure that it was level. just in time to ring for the next service. While the bell was being put in, Denny was grating the gravel road. The recent heavy rains formed gullies in the driveway and parking lot and it was in need of a good smoothing out. The overgrowth of the woodland areas of the Skete have been a chore, to say the least. There is much tree removal and trimming to be done. 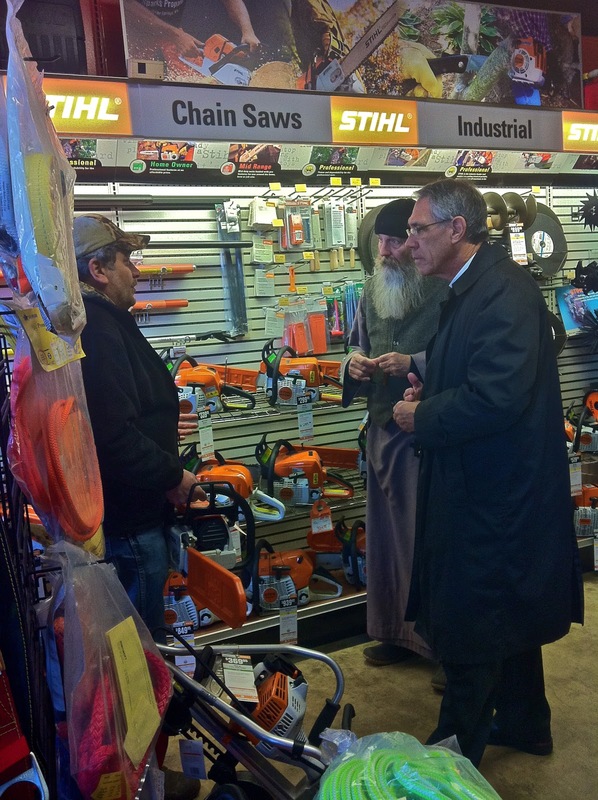 During the Winter, Seraphim and the Archbishop made the first purchase at the skete together - they bought a chainsaw. between Anna House and the barn. At first it looks as though there is nothing but trees, but as we look closer you see Seraphim’s head as he uses the chainsaw. ...and how is he reaching that tall tree? 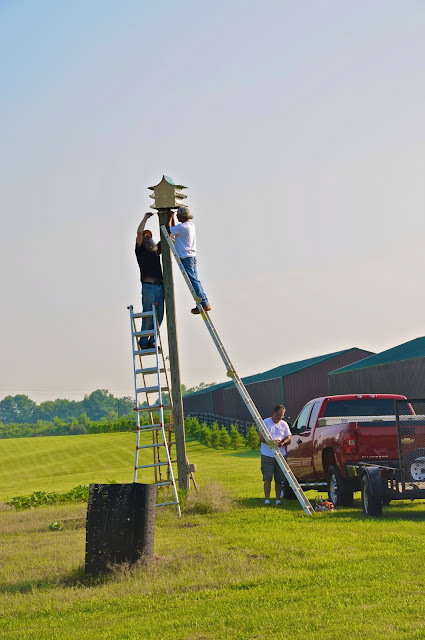 "2 scoops of monk please..."
and bat houses to be placed (it is our hope that this will help with some of the mosquitoes and other flying nuisances around the property). 18Remember ye not the former things, neither consider the things of old. 19Behold, I will do a new thing; now it shall spring forth; shall ye not know it? I will even make a way in the wilderness, and rivers in the desert.